Okra is a tasty summertime treat and a staple in many Southern homes. Freeze some while it's in season, and you'll be able to enjoy it whenever you like. This step-by-step guide will take you through the process of freezing okra. Fresh-picked okra works best for recipes, especially for freezing. Fresh okra is a slender, green, tube-like vegetable, and is sometimes even called "lady fingers" because of its shape. It's actually a pod filled with small white seeds. Okra should have unblemished skin when you buy it—if you can find it at your local market. It's not a highly popular vegetable in some regions, and not all grocers stock it. Your best chances of finding the vegetable are from May through September. To wash the okra, fill a bowl with equal parts white vinegar and water. Then, soak it in the solution for a minute or two, and rinse. The acetic acid in the vinegar kills bacteria ​and helps to dissolve the wax, pesticide, and fertilizer residues. It'll also rid just-picked okra of any bugs that may be hanging on. Then, cut off the stems, being careful not to cut into the seed cells. If you can see seeds, you're cutting off too much. Blanch your okra by submerging it in a pot of boiling water. Small okra pods need to be blanched for three minutes; large okra pods need four minutes. 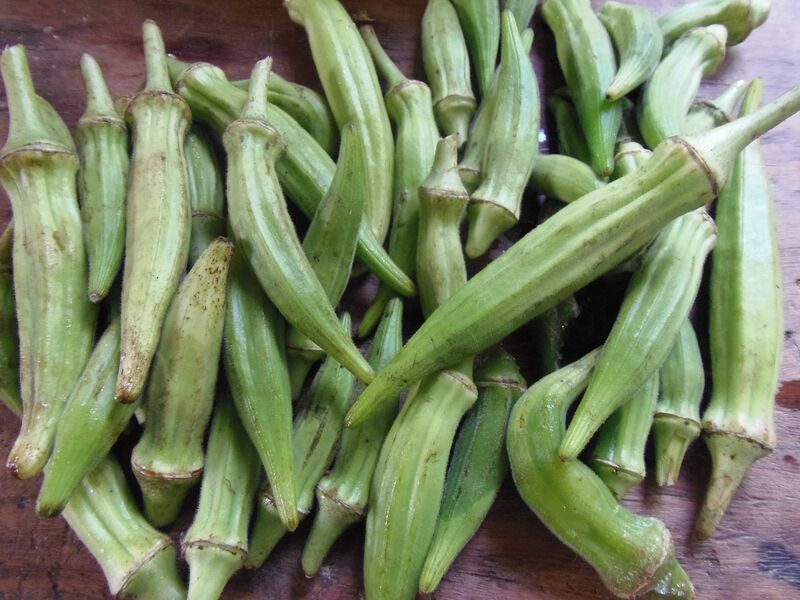 Blanching will halt the enzyme process, so your okra maintains that just-picked color, flavor, and texture. It's important to stop this enzymatic activity because it can cause okra (as well as other vegetables) to decay. These enzymes can survive freezing temperatures and continue the decaying process even though the okra is frozen. Pretreating the okra in boiling water kills the enzymes. 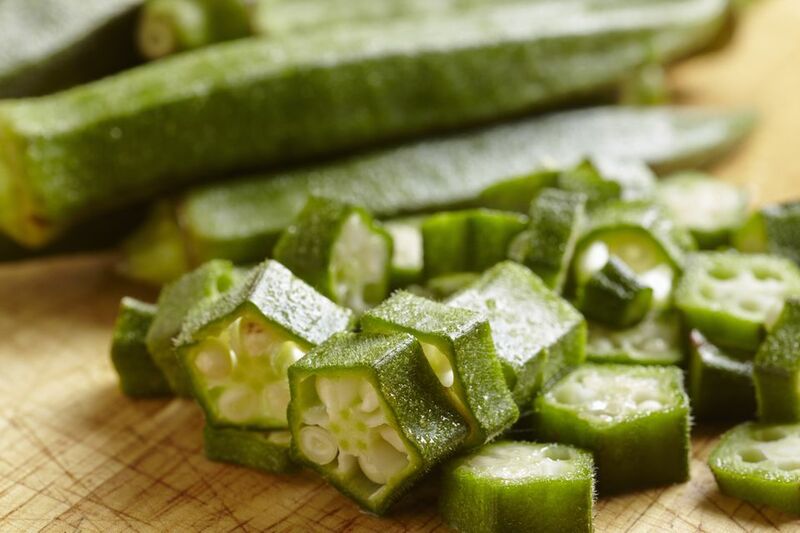 Transfer your blanched okra to an ice water bath to stop the cooking process. Let the pods cool for a few minutes; then, move them over to a colander to drain. Submerging okra pods in the ice bath, of course, helps to cool them off, but doing so also sets the color so the okra will look good—and even fresh-picked—when it comes out of the freezer. Leave the pods whole, or chop them up into bite-sized pieces—the choice is yours. If you plan to fry your okra later, go ahead and dredge the pieces in your favorite cornmeal or flour mixture. Spread your okra pods or pieces out on a cookie sheet, and flash-freeze them. This will ensure that your okra freezes in individual pieces, instead of clumps. Once the okra is frozen, transfer it to freezer bags, and return it to the freezer. Use it within a year, for the best quality. To use the okra, simply scoop out what you need, and add it to your recipe. It doesn't need to be thawed.